Premium Master Suites boast a larger en-suite bathroom with luxury whirlpool tub in addition to a separate rain shower and WC. Camouflaged by wooden panels, the bathroom offers marble twin vanities, large areas to hang your clothing, bathrobes, slippers and soft quality towels. Located on the north-eastern wing of the property, one on the ground floor and one on the upper level, the Premium Master Suites boast spacious oceanfront terraces to catch the rays of incredible sunrises over the Caribbean Sea, making you feel like a captain of your very own Spanish galleon. 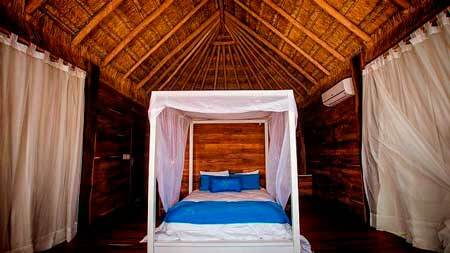 Your comfort is of paramount importance at Sian Ka’an Village, and as such, each suite is adorned with fine linens and deluxe feature duvets with synthetic options also available. If your needs require, a foldaway bed(s) for children can be set up in your suite.